Albanian Prime Minister Edi Rama and the so-called “Minister of Foreign Affairs of Kosovo” (a disputed Serbian province) Hashim Thachi met on Monday in Ulcinj, a coastal town in Montenegro near the Albanian state border which has an ethnic Albanian majority. 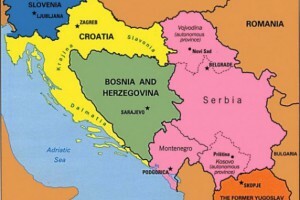 During the meeting Rama made an openly provocative statement towards Serbia, stating that if Albanians cannot be united through the EU, Albania and “Kosovo” would unite trough a “classical” unification, in other words by Albanian territorial annexation of the Serbian province of Kosovo and Metohija. The statement was not only a provocation for the Serbs in both Serbia and Montenegro but also for Greeks and Macedonians where Albanians also claim the "right to succeed." This "remark" was not Rama’s first mentioning of Greater Albania in one form or another. Previously, during his visit to Belgrade in November of 2014 he provoked Serbian Prime Minister Aleksandar Vučić by stating during the press conference that Serbia should accept the “fact” that Kosovo is an independent state, which was an open slap in the face for the host. In both cases the response of EU officials was just short of nonexistent. In fact, the "reaction" of Brussels was a direct sign of their approval for such behaviour from Albanian officials and their "style" of communication with Serbia. This was also a sign of the EU’s utter disrespect for Serbian territorial sovereignty and negligence of its dignity. Before Rama’s visit to Belgrade, earlier in October 2014, yet another serious Albanian provocation happened during the football match in Belgrade between the national teams of Serbia and Albania: a drone flew over the stadium carrying an Albanian flag shaped in the imaginary borders of "Greater Albania" which includes the territories of Serbia, Montenegro, Macedonia and Greece. According to some media reports it was Edi Rama’s brother who controlled the drone with his cell phone. Having in mind the experience of the last couple of decades, this kind of behaviour by the Albanian side is hardly imaginable without the serious assistance of the United States. Strangely enough, only one week after the NATO conference took place in the Serbian parliament, a conference organized by CSTO (Collective Security Treaty Organisation – the Russian equivalent of NATO) and Fund Slobodan Jovanović took place in the same room. However, this event was wholly ignored by the local mainstream media, and only a few members of parliament were present during the conference. The scandal over the military helicopter crash continues and as no government officials have yet resigned from their posts the public continues to demand responsibility be taken. Furthermore, just days after Edi Rama's scandalous statement rather than confronting this burning state security issue the Serbian parliament was embroiled in a debate over a lex-specialis (special law) that would enable the expropriation of land for “Belgrade on water,” a highly disputed megalomaniac construction project in central Belgrade. Serbian president Tomislav Nikolić accepted Russia's invitation to attend the Victory Day parade in Moscow on May 9. Serbia will also send a platoon of troops that will march on Red Square during the parade. This ought to be expected as Serbia was among the nations largely contributing to the victory over Nazism in World War 2. However, in light of the US and EU’s boycott of Russia over the Ukrainian conflict, Nikolić's decision was greeted with disapproval in the West. Having in mind that Serbia is a weak country in a position of semi-occupation, a country that complies with most of the EU/US humiliating demands towards it, this was undoubtedly a bold move by the Serbian officials. So how was this possible? The explanation is likely that Prime-Minister Vučić has simply too many problems on his plate at the moment (the helicopter tragedy, Edi Rama’s statements, a series of union strikes, popular discontent over signing of the Individual Partnership Action Plan with NATO, etc). Therefore, in order to appease the Serbian population, as he knew this would be a popular gesture amongst a great majority of Serbs, Vučić "allowed" President Nikolić to send the army to the Victory Day parade. On the other hand, to balance this, Vučić has accepted the United States Vice President Joseph Biden’s invitation to visit Washington. On Saturday evening the Holy Fire from the Church of the Holy Sepulchre in Jerusalem was flown to Belgrade, organized by the Russian Orthodox Church and Moscow’s Fund of Saint Basil the Great. The organization of this event was of the highest level. Once the bearers of the Holy Fire arrived, a platoon of the Guard, the elite unit of Serbian army, formed a festive gauntlet to greet them. Thousands of believers gathered in front of Saint Sava’s Cathedral to light their candles from the Holy Fire. When the Holy Fire arrived the patriarch of the Serbian Orthodox Church Irinej and the president of Serbia Nikolić lit the first candles, and the fire subsequently spread throughout the crowd in every direction. All the mainstream TV channels and press covered this event. A walk took place on Tuesday on the streets of Belgrade organized by a group of activists against abortion. The group of approximately 200 people walked behind a large Orthodox Christian icon in the central streets of Belgrade.